Macrium Reflect - Powerful Windows Backup Software - Ask Leo! Macrium Reflect is a full-featured backup program that supports everything that I consider critical to keeping your important data safely backed up. As anyone with even a little experience will tell you, you will lose something important someday without a backup; it’s not a matter of if, but a matter of when. And someone with more than a little experience will also be able to share horror stories of how and when they learned this important lesson. In my opinion, that’s why it’s critical that you backup your computer and data regularly. As I’ve said repeatedly, if your data is in only one place, it’s not backed up. Over the years, I’ve developed a set of criteria – a set of features and characteristics – that I want out of a backup program before I recommend it. Make a complete image backup of a disk and most importantly, your system disk. Restore that complete image to a machine that cannot itself boot because it contains an empty replacement hard disk. Browse and restore individual files from image backups. … if your data is in only one place, it’s not backed up. And, of course, like any good software, it needs to be relatively straightforward to use and give you reasonable support options. Additional features beyond those basics are nice, but certainly not required. 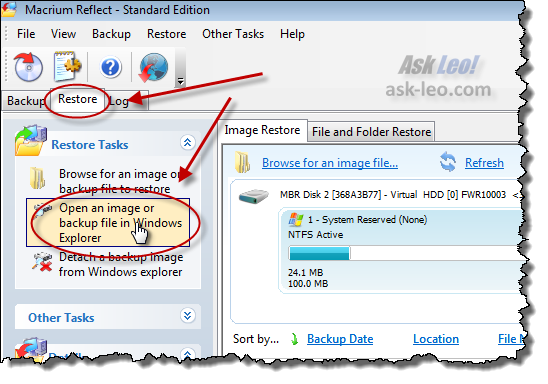 System image backups in Reflect are almost a one-click operation. Click the “Create an image of the partition(s) required to backup and restore Windows” and Macrium configures a backup for you to do just that. All that you need to do is specify where the backup image should be stored. Naturally, there are options to increase the compression of the image, protect it with a password, encrypt the backup, and more. But for a basic image backup, you can pretty much bypass all of that. Restoring an image is similarly straightforward, with one exception. For example, if you’ve replaced a damaged hard drive and you want to restore your most recent backup image to it, you’ll need something to boot from. Before you need it, use Reflect itself to create a bootable rescue disc and save it somewhere. That disk contains enough of an operating system to boot and run a copy of Reflect also included on that disk. That copy can then restore the backup image to the hard disk. Reflect stores disk images in .mrimg (for Macrium Reflect IMaGe) files. Because that contains everything, that’s all that you’ll need to restore an entire machine. But, because it contains everything, it’s also possible to browse that image file looking for individual files contained in the backup. In Macrium Reflect, you can mount a backup image as a virtual drive on your machine. What that means is that you could mount last week’s backup image of your machine as the F; drive and then use Windows Explorer – or any other Windows application – to browse the backup and view the files as they were at the time of that backup. Restoring a file that was originally backed up from your system drive would be as simple as copying that file from its location in the image mounted on F: to your hard disk C:. An incremental backup is nothing more than backing up only those files that have changed since the previous backup. Because the XML definition file contains all of the information about what was backed up and where it was placed when it comes time to make an incremental backup, Reflect need only look at that, locate the previous backup, note what files have changed on your system since then, and backup only those files. Come time to restore that image, you can select the most recent incremental image, which will then restore that and all of the backups up to and including the first. Scheduling a backup, then, becomes nothing more than telling Reflect “do the backup that’s described in this definition file on this schedule”. 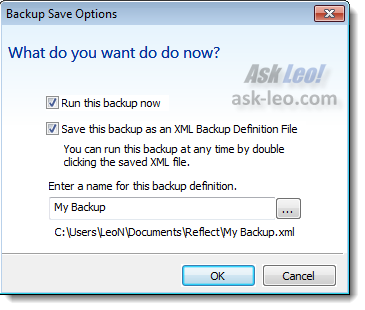 Reflect then automatically sets things up so that the backup happens automatically, without your needing to do a thing. I’ve focused on image backups, but Reflect also allows you to configure file backups. While image backups backup an “image” of your hard disk and everything on it (including all the files), file backups focus on backing up only files or, more commonly, a subset of all of the files on your system. An image backup is required if you want to restore your system to an empty replacement hard drive, since in addition to all of the files, it contains, all of the system overhead, and the boot information used to create a bootable machine. On the other hand, an image backup contains all of the files – there’s no way to exclude certain files from an image. A file-based backup is useful if you’re not concerned about backing up something that might later need to be bootable and you’re confident that you can specify everything that you might possibly want to restore in the future. For example, it might be enough for some folks to create a file backup of only “My Documents” and everything in it. I focus on image backups as being the most comprehensive. At the cost of some storage space, you know that everything is in there. Normally, you might expect to find an affiliate notice here, indicating that if you buy the product through one of my links, I might make a few dollars. As far as I can tell, Macrium Reflect has no affiliate program, so that’s not happening here. As I outline in my full disclosure, I typically pick the product and purchase it myself first (I got the Household 4 pack), and only after deciding to recommend it do I go looking for an affiliate opportunity. The presence (or in this case, the lack of such an opportunity) doesn’t affect what I recommend. Comprehensive online documentation and help. A knowledge base of articles that address common questions or expand on various backup scenarios and issue. An online support forum for purchased product owners that is regularly monitored by employees who respond (from my examination at this writing). Only image and differential backups can be made. Incremental backups are not available. Forum and email support is not available. The page for the free version includes a full comparison checklist. Personally, I find all of those to be deal breakers as they do not meet my original criteria. However, the free version is one way to safely take full system images if that’s all that you need to do. The Standard version includes all of those missing features and more. In my opinion it’s the version to get for home use. « Previous post: Why, when I’m doing nothing at all, will my hard disk suddenly start thrashing? I’ve used and recommended Macrium Reflect for years now. I think the only improvement possible would be a ‘Live CD’ version. I’m using Acronis 11 which is fairly popular. Is Macrium Reflect better? In which ways? Leo, I’ve used Acronis True Image. I think it would also make your cut. And it has had the features of Macrium for quite some time now. Recommend you test it out. I’d be interested in your comments. Leo has recommended Acronis backup for years. Recently, he has changed his recommendation to Macrium Reflect. This is reflected in the update to the original article recommending Acronis. One thing the article doesn’t make explicit that’s VERY important – remember to test your ability to actually boot from the recovery disk and access your backup images from that recovery boot before you commit to any particular backup software. Macrium Reflect has had some problems in the past with creating a recovery disk for 64 bit versions of Windows and certain hardware devices (like some USB flash drives that you’ve left plugged in to your computer between boot sequences), something you wouldn’t want to have to deal with if your hard disk crashes and you have no option but to try to recover from the repair disk! If you can’t actually successfully boot from the repair disk, access the device that contains the backup image(s), and navigate that device so that you can see the backup image(s), you won’t be able to recover from a complete hard disk crash if the need arises! The concern I have about image backups, is how do you know they worked? You probably won’t until you need it. I have used Casper copy/backup for years. It does all this one does, but file by file, no images. i can dual boot to the fully bootable second or even third drive to ensure the backups worked. What about EASEUS TODO Backup ?? it’s free and it – i think – meets your criteria . Leo, thank you again for your great work, a testament to your concern and dedication to the advancement of the average computer users knowledge and understanding. Please check out Easeus Todo Free, because I am certain you will find it far superior to any other, currently available, backup freeware. It provides two methods for making a bootable rescue disk, one using Linux and the other using WinPE, both do the job. It provides incremental and differential backups, file and partition/disc backups, mounting options, and excellent help available online or can be downloaded. Allows for “hot” backups and is not nearly as demanding on computer resources as Macrium. And when the cost is free it completely eliminates a major reason so many ignore the importance of making and maintaining system backups. Anyway, thanks again Leo and have a great “New Year”. Thanks for the info on macrium. I wanted to point out to those here that, if the boot disk fails to restart your system, their is another easy thing to try before reinstalling the image from other media (if your hard disk isn’t damaged). You can access all your documents, pictures, video and audio files WITHOUT your operating system. You can burn a free CD or DVD online of the UBUNTU Operating System. It will run off your DVD drive and enable you to copy those files before reformating the disk (sometimes the image hasn’t been incremented in a couple of weeks so there is still stuff there that you might lose). It’s easy and a gives a lot of peace of mind knowing you can read your hard drive even if it’s OS won’t boot. 800 lb gorilla question: no mention of norton backup / Drive Image… are they considered passe? Hi Leo. How does Macrium Reflect compare with Acronis? I use Acronis after I read your writeup about. Guess what? About 1 year after first starting to use Acronis, my hard drive failed. No problem. After installing a larger drive, I used the backup and my system worked like nothing had changed. I made incremental backups about every week and then new complete backups about every two months. I also followed your writeup about resizing the partition using Ubuntu Linux GParted, and that worked perfectly as well. Personally, I don’t see any complelling need to switch to Macrium Reflect. Thanks again! I would like to second or support what Bob Chachel on March 2, 2012 posted regarding Acronis. It was your recomendation of Acronis that encouraged me to purchase it in the first place. You are now recommending Macrium Reflect. I assume that it’s now your Backup of choice. If this is the case what does Macrium Reflect do that Acronis doesn’t? If it is indeed a better Backup program I would consider purchasing Macrium Reflect when my Acronis True Image Home 2012 expires in a few months. As I have come to admire and respect your knowledge and expertise, I would like your comments on this before I switch. Thank you. Easeus Todo Free – I ran into issues that made me uncomfortable, leading to frustration. Some choices left me with questions, which shouldn’t happen. Their help offered no definitive answers. The free version is so simple, very user friendly, and even fun to use. Their support is excellent, including videos. The options and extras far exceed those of Easeus Todo Free. Hi Leo! I installed free MR on new HP with 2 tb local c drive and 500 g datadrive. When i open mr it does not recognize any partitions recovery or even the c: drive. Only the second internal datadrive as source. MR is the 1st and only program i installed because i wanted good clean image of new computer. I restarted computer to see if that might be the problem but i get the same thing. I had the same problem as Terry did, on an HP Pavilion desktop. MR recognized only the newly-installed SSD drive, not the original HD at all. Of course, using the free edition, there is absolutely no way to get help from Macrium. I just assumed that the paid edition would work the same way, and moved on to an alternative. That’s no way to sell a product. I tried the free trial download and was very disappointed that it isn’t a full working software copy of the product. I dislike very much when software manufacturers do not allow potential customers to try out a full working version of their product. I did vent to the manufacturers that I would be un-installing their product since it doesn’t work out of the “gate”. I was going to try the “standard” and then buy the professional version if I liked how it worked. I understand that you recommended the product, you might want to include that it isn’t a try then buy product, it’s a buy now if you want the full working software. I found your web page on a google search for “are people who sell computers required to include a windows install disc with purchase”. Since I just purchased a new omputer on ebay and when through a little song and dance with the “seller” about the authentic Windows copy of the installed software being included with the purchase of the computer. In your article it mentioned backing up the computer, which lead me to this web page. Your high praise of the product lead me to the vendor’s software page. The vendor’s lame version of the trial software lead me back to your page, where I just had to add my “two cents” about the downloading a trial for a product that had limited use. Thanks for the referral to Reflect Leo. I tried the free edition and then bought the Standard edition and it is EXCELLENT. I had been a Ghost user for many years but it was always a nagging source of problems and failures, not to mention seemingly entrenched in every corner of my computers. Reflect works smooth as greased glass and even uninstalls very easily (I did that when I upgraded to the paid version). I had never before heard of Reflect in many years of computer use and only found your mention of it in one of your articles on another topics many months ago. You were spot on with your recommendation of Reflect. Another benefit is that it does not hog all my resources when it is running and I can use my computer normally at the same time. Thank you. I had good luck with Macrium Reflect Free on an old XP machine, but could not create a complete drive image for a new HP Win7 PC that has a GPT hard drive, which is only supported by the Pro version. EaseUS Todo Backup Free won’t work because there is an EFI system partition and a separate boot partition. I’ll be trying Paragon Backup and Recovery Free next. Steer clear from anything Paragon. The activation of the software they sell is a minefield. After weeks of not being to use a piece of software I paid good money for I uninstalled it and took my losses. They tried fixes, but were unsuccessful and just went around in circles. Their paranoia is their problem. I’ve tried the both, Macrium & Acronis. Never had any luck with any of them. DuDs. Hog A hell of alot of space on a disk, then in the OS recovery disc dept. 9 out of 10 times you are left holding your Hopes in your hand while you pray it works. It doesn’t. Johnny’s method: copy everything you want to save by old stand by,”copy paste, or send to” A new reformatted drive. Update folder(s)weekly, Daily as preferred. Have copy of ISO disc of OS. (W7) I’ve described my method before in another forum. still have yet to hear a complaint. SO much better. I have one spare drive for every drive I have EASEUS Partition Master 7.1.1 Home Edition to assign drive letters and format/partition. Works great every time. But not everything’s for everybody. Just to clarify for some people complaining about the free product – there’s a difference between the FREE version of Macrium Reflect and the 30 day TRIAL version of Macrium Reflect Standard. I’m quite happy with the Standard Trial and will most likely pay to continue its use after the 30 days. i jus came to know about you so i am facing a problem wth my desktop as well as laptop…. regarding the laptop my dvd/writer/player is not working but if i connect a external device eveything works fine….need help??? “Reflect could not find the WAIK. “An error occurred downloading the WAIK ISO. Reflect cannot continue. I am not sure that the download even started. Macrium Reflect Forum accepts only Paid Version members. Any guidance for me to proceed please ? I would isntead burn the Linux version of the recovery disc, which doesn’t require the download. “Johnny’s method” works, and I’ve used it many times when re-building a PC. The drawback is that it is very time and labor intensive. Reinstalling the OS requires reinstalling all applications and then reconfiguring them. Ultimately, you get your PC back, but many hours have been wasted. An image backup, in contrast, is fast. I restored a Win8 laptop in about five minutes last week. A few minutes more to pull in the latest Microsoft patches, and a couple minutes to restore the most recent versions of documents from a file backup. Total time was maybe 15 minutes. If your time has value, image backups are your friend. Coupled, of course, with routine backups of data files. Not mentioned in Leo’s article is a very, very important feature of Macrium Reflect. Reflect works equally well with MBR and GPT disks. If you have a new Win8 PC, it almost certainly has EFI/GPT booting, and older backup programs simply don’t know how to handle the new regime. If you are going to use Macrium Reflect, I strongly urge creation of the recovery media on a spare USB drive. The smallest one you have lying around will probably be ok. 500 Mb is adequate. And invest the extra effort to create the Windows PE media. It is much better than the bare-bones Linux version. Instead of the WAIK ISO, which I found to be a nuisance to deal with, I used the newer Assessment and Deployment Kit. adksetup.exe from Microsoft. The setup file and extracted files consume about 3 Gb of disk space, so you may want to park it on a partition other than the one with your OS to ensure it will not clutter a routine backup. I am now looking for a program that will allow me to create a backup image of this hybrid drive so I can use it to restore my OS/programs quickly in case of drive corruption or failure. I read about Macrium today, and downloaded the free version and created a disc image. Does anyone reading have any idea of whether there is a reasonable expectation that this image can be restored? Would not want to be disappointed if and when the time comes for me to use the backup. At this point, I’m a bit sorry I went with a hybrid since backups provide such peace of mind and have saved me days and days of time in the years that I have been using them. Will appreciate some feedback on this. Thanks. I have restored Macrium Reflect ISO images several times over 9 years, with complete success. The problem is when your computer dies, and you would like to restore your ISO image to a new computer (with all its new-fangled hardware)! I was using Acronis 11 on my Windows 7 pc and it worked fine, now have a new Windows 8 pc and the Acronis version I had would not work on it. Read horror stories about the new Acronis so decided to try the Macrium Reflect after reading about it in your articles. I decided to try the free version first and if I liked it would buy it. I am only really interested in manual image backups. However, this Macrium will not work on my Win8 machine. It gets errors about what their knowledge base says is a Microsoft service (VSS), tried everything in their knowledge base (all references to this problem are several years old) to fix it with no luck. Strangely enough, in one place in their KB it says using this VSS is optional and only used for expanded options, and that they have their own service that can be used instead without the VSS problems if these options not needed, but I can find no way to do this. This has turned into a real quagmire, and I’m glad that I did not buy it first. Can you shed any light on this problem? Nope. I get nothing from them. I use Macrium Reflect V. 5. If I choose to use incremental backups starting with a full backup on Sunday and make an incremental one each day of the week, what happens if the incremental backup I make on Wednesday becomes corrupt? Does this mean I cannot use the entire week’s incremental backups for my next backup, for example, on the following Sunday? It means that the backups prior to Wednesday are all good, and the ones from Wednesday on are not, until you restart the sequence with a new full backup. Does Macrium validate/ensure that the previous incremental are in good condition before it makes a new incremental backup? Lets say I did a full backup on Sunday and schedule auto incremental for all future days, when Macrium is doing incremental backup on Thursday, will Macrium check that all the previous incremental backups (Mon, Tue, Wed) are in good working condition first before doing incremental backup on Thursday? Will it prompt user if it detect a bad incremental backup? If today is Thursday, lets say Macrium detected that the Tuesday incremental backup is bad or corrupted, Wed incremental backup is in good condition, will Macrium do the incremental backup with the changes made in the PC from Tuesday to Thursday (since the last good condition incremental backup is Monday). I like this long running post and came here from another of Leo’s articles reviewing Windows 10 backup. However, I’m not sure the excellent criteria for a backup system are enough for ‘real families’. There are some extra things needed to handle the practicalities of having laptops that only occasionally get plugged into an external back-up drive. A complete new image takes 12-18 hours to download via USB2 (they’re not new laptops) because of the hundreds of GB of pictures, music, etc. and, basically, no-one – especially the kids – is prepared to leave their PCs untouched for so long. Alternatively, we could use a NAS target and backup over WiFi trading off speed for convenience. So the idea of incremental images backups is great… so long as these are a) triggered automatically when a laptop is plugged into the target drive (rather than scheduled) or detects the NAS, and b) the time needed is ‘reasonable’ so there’s a good chance of it completing before the laptop goes to school / work / etc. So my questions are: does a tool, like Macrium work with NAS / WiFi and how big is a typical incremental backup (I mean apart from user files, how much does the system change over, let’s say, a week)? Put another way… if a laptop has, for example, a three hour window of opportunity to run its backup, is this likely to be long enough? You can continue to use the computer while running a backup with a program like Macrium Reflect. I’ve found that it has very little impact on the speed of my computer while it is being backed up since it yields use of the hard drive to other operations when it is backing up. All I have for you is a very genuine and gracious thank you for adding one more thing to my list of things to be thankful for on this Thanksgiving Day. (1) while trying to replace ONLY Linux Ubuntu in “dual boot” environment with Win 10 both OSes were removed from HD with no warning. The original HD had previously been imaged (per Leo’s persistent recommendation) and original image was easily restored. (2) after restoring the imaged HD and while trying to remove Linux and its associated Grub (?) boot loader, the launch option for Win 10 disappeared. Luckily the Macrium “rescue disk” also includes boot problem correction capability which finally removed the annoying dual boot pgm that pointed to Ubuntu instead of Win. The old song says – “the best things in life are free”. Macrium Reflect is an excellent example. Thanx Leo for the EXCELLENT advice. Thanks for teaching so nicely about computer backups on this page. Let me commend you for your caring to do all this GREAT WORK for beginners like us. I understand that you have been playing with computers for many decades. I have a question. Will macrium reflect create a complete system image of my laptop* OS hard-disk for me in a way that will in effect be the same as a complete system image that Windows 7 Professional can easily create for me if I keep JUST ONE OS installed on my laptop? What I mean is: I have created 4 partitions on my laptop* OS hard-disk (all primary) and installed these four operating systems in these partitions 1) Windows XP 2) Windows Vista Home Premium 3) Windows 7 Professional 4) Fedora 24 Workstation. Windows 7 Professional refuses to create a complete system image if more than 1 of the OS hard-disk partitions contains operating systems; It does create a complete system image if the three other partitions contain JUST FILES and don’t have operating systems installed on them. I have successfully created a 220 GB complete system image of my laptop* OS hard-disk using macrium reflect because Windows 7 Professional doesn’t offer that facility for enthusiasts like me who don’t prefer to forget the feelings they used to get when they worked on old operating systems 7 or 11 years ago. Can I format my entire OS hard-disk by putting my faith in the macrium reflect system image? Will I get back my 4 OS working system by installing the system image using the rescue disk that I have created along with this 220 GB macrium file just as I used to get back my 1 OS working Win7 system by installing a windows system image of that system using Windows 7 rescue disk and the Win7 complete system image for the 1 OS Win7 system? I have typed this question in a hurry. Please be kind to excuse typographical errors and any inadequacies in the way of explanation. A system image backup like Macrium Reflect or EaseUS Todo backs up and can restore all of the partitions you tell it to back up. So yes, if those other OS partitions are included in the backup, they will be restored, and you will be able to boot those additional operating systems. I would just like to add that I’ve been using Macrium Reflect for 9 years and found it brilliant. When occasionally an error has developed in my computer, perhaps because of a virus or malware, I have just done a restore, using Macrium Reflect, of an ISO Image of my old hard disc, and I am completely back to “pure and clean”! There is a problem ahead though: when this current computer dies, the ISO image won’t be fully compatible with the new computer’s hardware. I have just had a “Senior Associate” of Dell confidently tell me there will be no problem at all, that their latest computers can deal with conflicts all by themselves. I doubt it. What I will probably do is immediately make an ISO Image of the new computer’s hard disc, then “restore” my old computer’s ISO image to the new computer and SEE what happens. If there are too many problems, then I will restore the ISO image of the new computer (to the new computer), and resign myself to re-installing all my apps and copying over all my old data. I am looking for a new backup solution for my family’s four laptops, because of several recent failures of Casper Secure Drive Backup (which we have used for years). All computers have whole disk encryption with Symantec Encryption Desktop (formerly PGP). Since I cannot find any other backup program that currently works with Symantec Encryption (Macrium used to work with PGP, according to an old web page, but the current manual does not mention Symantec Encryption), and Symantec Encryption does not support the current version of Windows 10 (1709), I figure I will have to switch to BitLocker for WDE, and will then also use it for virtual encrypted drives, which is the other feature of Symantec Encryption which I use. An expert on another forum recommended Image for Windows. I have researched it, and it appears to be a reliable program which works with BitLocker, but it is not reviewed on your site. I would appreciate hearing how Macrium Reflect compares with Image for Windows, particularly when used on laptops using BitLocker for WDE and virtual encrypted drives. I”ve actually not heard of “Image for Windows” before, so I have no experience with it.